Posted on July 16, 2013, in Audiobooks, Crime and thrillers and tagged audiobooks, crime fiction. Bookmark the permalink. 8 Comments. I’m so glad that you wrote this blog. It says all the things that i would like to say but can’t. 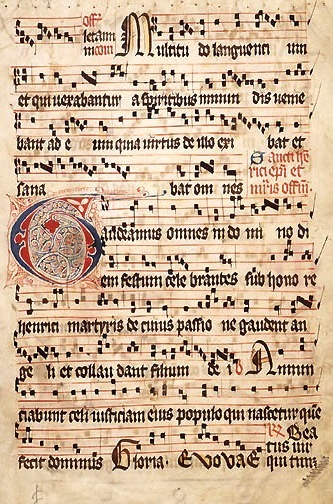 I recently read The Beautiful Mystery and was fascinated by the information about neumes and the methods of passing on to others information about a piece of music before our familiar five line staff came into use. I had never even wondered if anything came before the staff. This book was like a breath of fresh air in providing enough historical information to be able to follow the story without weighing you down in facts. You can branch off on your own to get a further understanding of neumes. As a child I used to fantasize about somewhere out there were people who spoke a language which was purely musical – people with perfect pitch of course. You didn;t produce different sounds for different words, just a rapid series of notes. For example, if middle C on the piano is euivalent to our letter A the the word BED becomes C#, E, E flat. You know way more about music than I do – can’t sing for toffee myself even though I am from Wales and we’re known as the land of song – and i can’t play any musicial instrument either. But I like listening and appreciating the output of people who can do these things. I learned today that these chants have a relaxing effect like meditation because they stimulate alpha waves in the brain. So could be something I listen to when I need calming down. Interesting. I also don’t usually blog about my audiobooks — or I may mention them, but I do not review them. I have been listening primarily to history. Since we moved to Virginia I felt the need to know more about the founders as well as the Civil War. But I know my limitations — I am not a historian and have difficulty thinking like one. I can tell if a book is interesting or well written, but have some difficulty knowing how well sourced or accurate it is. I just don’t have enough background in the field. As for Gregorian Chant, I own a CD of it, but I can’t recall why. I listen to some Sanskrit chanting — because of my interest in yoga and find similarities in the effects of both. To know whether the book is accurate you’d have to read multiple books on the same subject I think and to be able to compare interpretations. Something that I learned from doing a university course on history was that you always have to look at the agenda of the person who’s writing the book or the original source document.